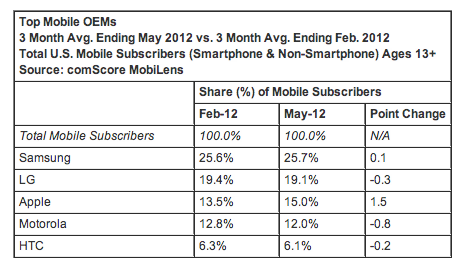 comScore just released its latest monthly mobile numbers, which chart mobile phone usage for a three-month average period ending in May 2012. During this time, 234 million Americans age 13 and older used mobile devices, which is consistent with the company’s previous report from February. Samsung ranked as the top handset manufacturer overall with a 25.7% market share, and Android came out on top, too, with a 50.9% share versus Apple’s 31.9%. Samsung’s position in terms of its share of mobile subscribers has barely changed since the last ranking in February of this year, the report found, up just 0.1 percentage points since then. Following Samsung were LG (19.1%), Apple (15.0%), Motorola (12.0%) and HTC (6.1%). The firm again reported that Android was the most popular smartphone platform (50.9% share), which is up only slightly (0.8 points) over February. Apple saw a bigger gain – 1.7 percentage points – but accounted for a smaller market share at 30.2%. RIM is still hanging onto third place with a 11.4% share, but its numbers are dropping. RIM is down 2 percentage points in May, and was down 2.9 percentage points in the previous ranking. 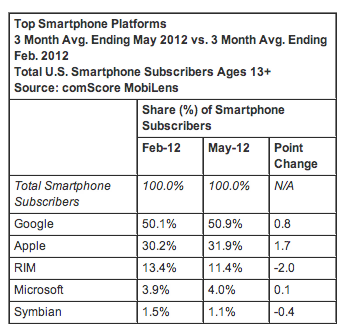 Microsoft (4.0% share) and Symbian (1.1%) rounded out the list. comScore also looked into the usage of other functions on our phones not related to making calls. 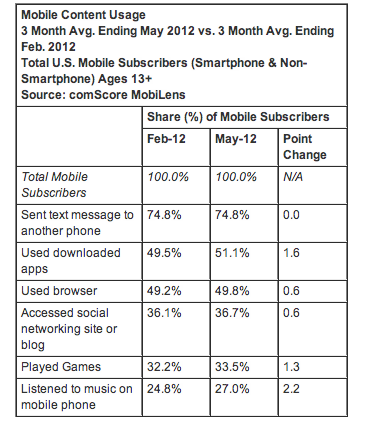 In May, 74.8% of U.S. mobile subscribers used text messaging, for example. Mobile application use climbed 1.6 percentage points to reach 51.1% of subscribers while web browsers were used by 49.8% of subscribers (up 0.6 points). That’s right – comScore found that more people are now using apps than web browsers. Last time the company reported these numbers, it found apps and browsers were neck-and-neck at 47.6% and 47.5%, respectively. But app usage had been growing – it had jumped 5.1 percentage points in December and jumped again this time. Usage of social networking sites and blogs was up 0.6 points to a 36.7% share of mobile subscribers. Gaming was up even more (1.3 points) to reach 33.5% of the audience, but music was up the most (2.2 points) to reach a 27% share. The report follows two other mobile rankings out today – that of Net Applications and StatCounter – which examined mobile web use and found Apple’s iOS far ahead of Android or others. But those figures speak more to usage than market share. comScore’s data, however, came from a survey of over 30,000 U.S. mobile subscribers, while other firms use hit-based measurement techniques.